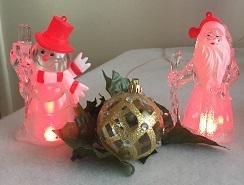 For this hack, I removed the MWM parts from an Ear Hat and used the LEDs to uplight some holiday themed, plastic figures that were purchased from Dollar Tree. These figurines come with RGB LED assemblies in their bases and are designed to be uplit. This is a no-brainer. Normally, it's not difficult to remove the installed LED assembly with just a little bit of prying. The Ear Hat used for this caper is the one in the picture and NOT the 60th Anniversary Hat. That is a completely different animal and I've not yet found a way to get at the MWM components without totally destroying that hat. This first task is to remove the two pieces of the foam inner liners. The outer one is a narrow band and is the most fragile. 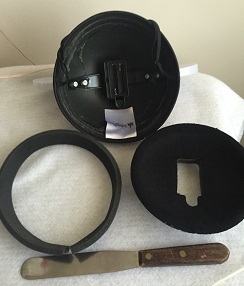 The inner foam liner is much thicker and wasn't as lavishly glued down as the outer band. To remove the outer band, I used a narrow, flexible spatula and located a starting point that wasn't tightly glued down. Once that start was accomplished, the spatula was worked along the rest of the band with a slight sawing motion to help separate the foam from the outer hat. The band came apart near the label. Other than that, it was essentially intact. With the outer liner out of the way, I found a loose edge for the inner liner and worked my fingers under it. Then I simply worked my way around the hat finding the glued areas and gently pulling upward to pry the foam from the glue. In the end, the inner foam liner came out as a single piece that was, more or less, intact. Once that's finished, the plastic ears are pried open so the ribbon cables holding the LEDs, etc may be supported while unscrewing the screws underneath. 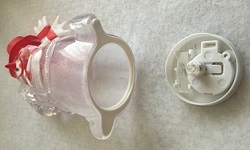 The freed LED assemblies are fed through the opening in the cap and the plastic harness underneath will come free. The mainboard was pried up from the plastic harness and the wires to the battery holder and switch were desoldered. For pics and more extensive discussion, see Milluzzi Labs' Glow with the Show Ears Teardown page. The main difference between his write up and what I found was the lack of any rivets. I only encountered screws. To prepare the figures from Dollar Tree, the included LED assembly was removed by simply prying it out. That left a large hole to position over the LEDs of the Ear Hat MWM components. The MWM board was wrapped with anti-static plastic to protect from static and possible shorting by any of the stuff that was piled on top to hide it. In this setup, some spare 'leaves', taken from the poinsettia arrangement, were used along with a spare ornament. ​​ The figures are also of a good size for this application as the distance between figures is limited to the length of the ribbon cables connecting the LEDs. Their plastic construction allows IR signals to pass through them and be recognized by the MWM IR receiver located right next to the right LED. In the image at the top of the page, the IR receiver is beneath the snowman figure which is placed a bit forward of the Santa figure - taking care that the leaves and ornament don't obscure any IR transmissions that may be sent to this setup.